The Resource Description Framework (RDF) is a family of World Wide Web Consortium (W3C) specifications  originally designed as a metadata data model. It has come to be used as a general method for conceptual description or modeling of information that is implemented in web resources, using a variety of syntax notations and data serialization formats. It is also used in knowledge management applications. The RDF 1.1 specification was published in 2014. The RDF data model is similar to classic conceptual modeling approaches such as entity–relationship or class diagrams, as it is based upon the idea of making statements about resources (in particular web resources) in the form of subject–predicate–object expressions. These expressions are known as triples in RDF terminology. The subject denotes the resource, and the predicate denotes traits or aspects of the resource and expresses a relationship between the subject and the object. For example, one way to represent the notion "The sky has the color blue" in RDF is as the triple: a subject denoting "the sky", a predicate denoting "has", and an object denoting "the color blue". Therefore RDF swaps object for subject that would be used in the classical notation of an entity–attribute–value model within object-oriented design; object (sky), attribute (color) and value (blue). RDF is an abstract model with several serialization formats (i.e., file formats), and so the particular way in which a resource or triple is encoded varies from format to format. This mechanism for describing resources is a major component in the W3C's Semantic Web activity: an evolutionary stage of the World Wide Web in which automated software can store, exchange, and use machine-readable information distributed throughout the Web, in turn enabling users to deal with the information with greater efficiency and certainty. RDF's simple data model and ability to model disparate, abstract concepts has also led to its increasing use in knowledge management applications unrelated to Semantic Web activity. A collection of RDF statements intrinsically represents a labeled, directed multi-graph. As such, an RDF-based data model is more naturally suited to certain kinds of knowledge representation than the relational model and other ontological models. However, in practice, RDF data is often persisted in relational database or native representations also called Triplestores, or Quad stores if context (i.e. the named graph) is also persisted for each RDF triple. ShEX, or Shape Expressions, is a language for expressing constraints on RDF graphs. It includes the cardinality constraints from OSLC Resource Shapes and Dublin Core Description Set Profiles as well as logical connectives for disjunction and polymorphism. As RDFS and OWL demonstrate, one can build additional ontology languages upon RDF. There were several ancestors to the W3C's RDF. Technically the closest was MCF, a project initiated between 1995 and 1997 by Ramanathan V. Guha while at Apple Computer and continued, with contributions from Tim Bray, during his tenure at Netscape Communications Corporation. Ideas from the Dublin Core community, and from PICS, the Platform for Internet Content Selection (the W3C's early Web content labelling system) were also key in shaping the direction of the RDF project. The W3C published a specification of RDF's data model and an XML serialization as a recommendation in 1999. The history of prior versions of this work can be found here, indicating a start sometime in 1997. Work then began on a new version that was published as a set of related specifications in 2004. While there are a few implementations based on the 1999 Recommendation that have yet to be completely updated, adoption of the improved specifications has been rapid since they were developed in full public view, unlike some earlier technologies of the W3C. Most newcomers to RDF are unaware that the older specifications even exist. In June 2010, W3C organized a workshop to gather feedback from the Web community and discuss possible revisions and improvements to RDF. Some libraries publish their catalogue in RDF, one of them the Hungarian Széchényi Library. rdf:Statement, rdf:subject, rdf:predicate, rdf:object are used for reification (see below). This vocabulary is used as a foundation for RDF Schema where it is extended. Turtle, a compact, human-friendly format. N-Triples, a very simple, easy-to-parse, line-based format that is not as compact as Turtle. N-Quads, a superset of N-Triples, for serializing multiple RDF graphs. N3 or Notation 3, a non-standard serialization that is very similar to Turtle, but has some additional features, such as the ability to define inference rules. RDF/XML, an XML-based syntax that was the first standard format for serializing RDF. RDF/XML is sometimes misleadingly called simply RDF because it was introduced among the other W3C specifications defining RDF and it was historically the first W3C standard RDF serialization format. However, it is important to distinguish the RDF/XML format from the abstract RDF model itself. Although the RDF/XML format is still in use, other RDF serializations are now preferred by many RDF users, both because they are more human-friendly, and because some RDF graphs are not representable in RDF/XML due to restrictions on the syntax of XML QNames. With a little effort, virtually any arbitrary XML may also be interpreted as RDF using GRDDL (pronounced 'griddle'), Gleaning Resource Descriptions from Dialects of Languages. RDF triples may be stored in a type of database called a triplestore. The subject of an RDF statement is either a uniform resource identifier (URI) or a blank node, both of which denote resources. Resources indicated by blank nodes are called anonymous resources. They are not directly identifiable from the RDF statement. The predicate is a URI which also indicates a resource, representing a relationship. The object is a URI, blank node or a Unicode string literal. In Semantic Web applications, and in relatively popular applications of RDF like RSS and FOAF (Friend of a Friend), resources tend to be represented by URIs that intentionally denote, and can be used to access, actual data on the World Wide Web. But RDF, in general, is not limited to the description of Internet-based resources. In fact, the URI that names a resource does not have to be dereferenceable at all. For example, a URI that begins with "http:" and is used as the subject of an RDF statement does not necessarily have to represent a resource that is accessible via HTTP, nor does it need to represent a tangible, network-accessible resource — such a URI could represent absolutely anything. However, there is broad agreement that a bare URI (without a # symbol) which returns a 300-level coded response when used in an HTTP GET request should be treated as denoting the internet resource that it succeeds in accessing. is intended by its owners to refer to the class of all Merlot red wines by vintner (i.e., instances of the above URI each represent the class of all wine produced by a single vintner), a definition which is expressed by the OWL ontology — itself an RDF document — in which it occurs. Without careful analysis of the definition, one might erroneously conclude that an instance of the above URI was something physical, instead of a type of wine. Note that this is not a 'bare' resource identifier, but is rather a URI reference, containing the '#' character and ending with a fragment identifier. The body of knowledge modeled by a collection of statements may be subjected to reification, in which each statement (that is each triple subject-predicate-object altogether) is assigned a URI and treated as a resource about which additional statements can be made, as in "Jane says that John is the author of document X". Reification is sometimes important in order to deduce a level of confidence or degree of usefulness for each statement. In a reified RDF database, each original statement, being a resource, itself, most likely has at least three additional statements made about it: one to assert that its subject is some resource, one to assert that its predicate is some resource, and one to assert that its object is some resource or literal. More statements about the original statement may also exist, depending on the application's needs. Borrowing from concepts available in logic (and as illustrated in graphical notations such as conceptual graphs and topic maps), some RDF model implementations acknowledge that it is sometimes useful to group statements according to different criteria, called situations, contexts, or scopes, as discussed in articles by RDF specification co-editor Graham Klyne. For example, a statement can be associated with a context, named by a URI, in order to assert an "is true in" relationship. As another example, it is sometimes convenient to group statements by their source, which can be identified by a URI, such as the URI of a particular RDF/XML document. Then, when updates are made to the source, corresponding statements can be changed in the model, as well. Implementation of scopes does not necessarily require fully reified statements. Some implementations allow a single scope identifier to be associated with a statement that has not been assigned a URI, itself. Likewise named graphs in which a set of triples is named by a URI can represent context without the need to reify the triples. The predominant query language for RDF graphs is SPARQL. SPARQL is an SQL-like language, and a recommendation of the W3C as of January 15, 2008. An example of a SPARQL query to show country capitals in Africa, using a fictional ontology. RQL, one of the first declarative languages for uniformly querying RDF schemas and resource descriptions, implemented in RDFSuite. XUL has a template element in which to declare rules for matching data in RDF. XUL uses RDF extensively for databinding. 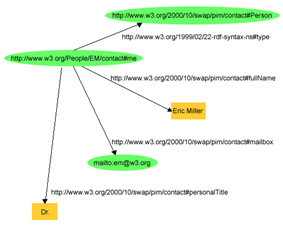 The following example is taken from the W3C website describing a resource with statements "there is a Person identified by http://www.w3.org/People/EM/contact#me, whose name is Eric Miller, whose email address is e.miller123(at)example (changed for security purposes), and whose title is Dr. The resource "http://www.w3.org/People/EM/contact#me" is the subject. "Dr." (with a predicate "whose title is"). The subject is a URI. "whose title is" is http://www.w3.org/2000/10/swap/pim/contact#personalTitle. In addition, the subject has a type (with URI http://www.w3.org/1999/02/22-rdf-syntax-ns#type), which is person (with URI http://www.w3.org/2000/10/swap/pim/contact#Person). eric:me contact:fullName "Eric Miller" . In the English language statement 'New York has the postal abbreviation NY' , 'New York' would be the subject, 'has the postal abbreviation' the predicate and 'NY' the object. In this example, "urn:x-states:New%20York" is the URI for a resource that denotes the US state ), and "NY" is a literal string. Note that the URIs chosen here are not standard, and don't need to be, as long as their meaning is known to whatever is reading them. However, RDF puts the information in a formal way that a machine can understand. The purpose of RDF is to provide an encoding and interpretation mechanism so that resources can be described in a way that particular software can understand it; in other words, so that software can access and use information that it otherwise couldn't use. Both versions of the statements above are wordy because one requirement for an RDF resource (as a subject or a predicate) is that it be unique. The subject resource must be unique in an attempt to pinpoint the exact resource being described. The predicate needs to be unique in order to reduce the chance that the idea of definition for the concept of a title established by the Dublin Core Metadata Initiative), it will also know that this title is different from a land title or an honorary title or just the letters t-i-t-l-e put together. Sigma - Application from DERI in National University of Ireland, Galway(NUIG). Creative Commons - Uses RDF to embed license information in web pages and mp3 files. DOAC (Description of a Career) - supplements FOAF to allow the sharing of résumé information. Enterprise Architect: MDG Technology for ODM (ODM supports RDF and OWL). FOAF (Friend of a Friend) - designed to describe people, their interests and interconnections. Haystack client - Semantic web browser from MIT CS & AI lab. IDEAS Group - developing a formal 4D ontology for Enterprise Architecture using RDF as the encoding. Microsoft shipped a product, Connected Services Framework, which provides RDF-based Profile Management capabilities. MusicBrainz - Publishes information about Music Albums. NEPOMUK, an open-source software specification for a Social Semantic desktop uses RDF as a storage format for collected metadata. NEPOMUK is mostly known because of its integration into the KDE SC 4 desktop environment. RDF Site Summary - one of several "RSS" languages for publishing information about updates made to a web page; it is often used for disseminating news article summaries and sharing weblog content. ResumeRDF - developed to express information contained in a personal Resume or Curriculum Vitae (CV) on the Semantic Web. This includes information about work and academic experience, skills, etc. SIOC (Semantically-Interlinked Online Communities) - designed to describe online communities and to create connections between Internet-based discussions from message boards, weblogs and mailing lists. Many other RDF schemas are available by searching SchemaWeb. Some uses of RDF include research into social networking. It will also help people in business fields understand better their relationships with members of industries that could be of use for product placement. It will also help scientists understand how people are connected to one another. RDF is being used to have a better understanding of road traffic patterns. This is because the information regarding traffic patterns is on different websites, and RDF is used to integrate information from different sources on the web. Before, the common methodology was using keyword searching, but this method is problematic because it does not consider synonyms. This is why ontologies are useful in this situation. But one of the issues that comes up when trying to efficiently study traffic is that to fully understand traffic, concepts related to people, streets, and roads must be well understood. Since these are human concepts, they require the addition of fuzzy logic. This is because values that are useful when describing roads, like slipperiness, are not precise concepts and cannot be measured. This would imply that the best solution would incorporate both fuzzy logic and ontology. Graph theory - An RDF model is a labeled, directed multi-graph. ^ "XML and Semantic Web W3C Standards Timeline". 2012-02-04. ^ http://www.w3.org/TR/PR-rdf-syntax/ "Resource Description Framework (RDF) Model and Syntax Specification"
^ Dr. Leslie Sikos. "Major RDF syntaxes. In: RDF tutorial". Retrieved 8 July 2011. ^ Dr. Leslie Sikos. "Standard websites". Retrieved 8 July 2011. ^ "Resource Description Framework (RDF) Model and Syntax Specification". 22 Feb 1999. Retrieved 5 May 2014. ^ Status for Resource Description Framework (RDF) Model and Syntax Specification. W3.org. Retrieved on 2014-05-30. ^ "RDF Vocabulary Description Language 1.0: RDF Schema". ^ "RDF 1.1 Turtle: Terse RDF Triple Language". W3C. 9 Jan 2014. Retrieved 2014-02-22. ^ "application/rdf+xml Media Type Registration". IETF. September 2004. p. 2. Retrieved 2011-01-08. ^ "RDF 1.1 Turtle: Terse RDF Triple Language". W3C. 9 January 2014. ^ "RDF 1.1 N-Triples: A line-based syntax for an RDF graph". ^ "N-Quads: Extending N-Triples with Context". 2012-06-25. ^ "JSON-LD 1.0: A JSON-based Serialization for Linked Data". W3C. ^ "RDF 1.1 XML Syntax". ^ "Problems of the RDF syntax". Vuk Miličić. ^ "The RDF Query Language (RQL)". The ICS-FORTH RDFSuite. ICS-FORTH. ^ a b c "RDF Primer". ^ DCMI Metadata Terms. Dublincore.org. Retrieved on 2014-05-30.